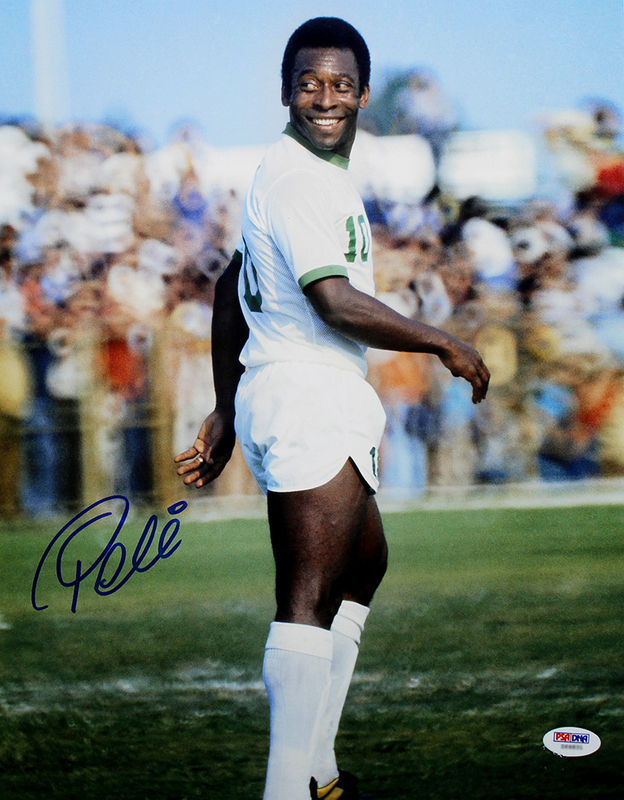 These New York Cosmos 11x14 photos have been personally hand signed by Brazil soccer legend Pele. Each autographed photo includes authentication from PSA/DNA. Pele is widely regarded as the greatest soccer player of all time. He is the most successful league goal scorer in the world, with 541 league goals. He won three FIFA World Cups, the only player to do so, and is the all-time leading goal scorer for Brazil. In 1975, Pele came out of semi-retirement to play with the New York Cosmos in the North American Soccer League. He is credited with significantly increasing the interest of the sport of soccer in the United States. In 1977, he led the Cosmos to the NASL Championship. He was inducted to the American National Soccer Hall of Fame in 1993, and in 1999, Pele was elected Athlete of the Century by the IOC.